It may be flippant to paraphrase the RAF’s motto into a cynical equivalent for the Royal Navy but purchasing chickens now coming home to roost under Admiralty Arch are a product of a whole series of predecessors to the luckless Phillip Hammond as Minister of Defence. All of them have been faced with an impossible task: sustain global commitments on a shoestring budget. His particular crime? To be the mug holding the parcel when the music stopped. For decades, Britain has deluded itself that it could achieve the twin goals of securing jobs by building huge defense contracts in the UK. Despite some catastrophic outcomes from this—from Blue Streak in the sixties to Nimrod replacement in the noughties—’big-ticket items’ like warships have been built in UK yards, most recently mostly those of BAE. BAE is a prime illustration of how heavy industry in the West struggles to survive in a world where developing countries are increasingly assuming their own naval shipbuilding. Worse than that, it is now obvious that a private company’s primary focus on profitability cannot be reconciled with a government’s sovereign requirement to build warships in domestic shipyards. It is now equally clear is that European governments eager to cash in on the post-Cold War peace dividend deluded themselves into believing that costly and unprofitable industrial activities, such as naval shipbuilding, would become sustainable and affordable simply by virtue of being handed over to private industry. This convenient fiction—that privatised shipyards can better compete for commercial ship orders—is now conclusively discredited. What is that ‘global market’? Well, the situation a century ago was Europe built 80% of the world’s ships and the Clyde was grandaddy of ’em all. That profile has changed massively with Europe down below 20%, South Korea boasting 8 of the 10 biggest yards and even Japan being beaten to those last two spots by an emerging China. As well as dominating the market, these three countries have effectively edged European yard out of most shipbuilding segments. Europeans had already been penned into the most expensive passenger segment (liners, ferries, large yachts, etc), as well as the similarly expensive military (not listed above because relatively small in tonnage). Meanwhile, low labour costs (not necessarily labour efficiency) have secured oriental yards the bulk of world tonnage construction, 99% of it for export. Despite their technical skills, Europeans gave up competing in the bulk carrier market; even the Danish container giant Maersk couldn’t build its own ships economically. However, because of jealous protection of home industries endemic in Europe, over 300 yards still exist—most of them hopelessly small and inefficient and just a few (like BAE) more hopefully big. But still inefficient. 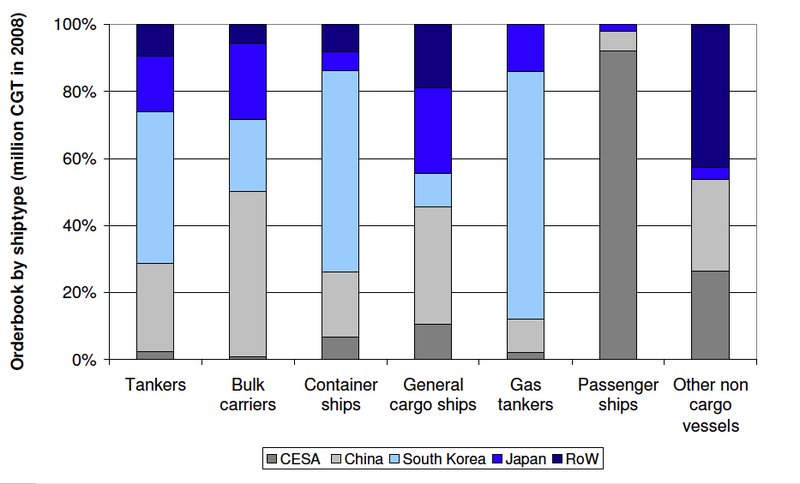 Whereas European production per enterprise averages €4m, in South Korea it is €22m and €34m in China. Such efficiencies of scale are amplified building a 350,000-ton ULOC or 500,000-ton ULCC. The Portsmouths and Govans—let alone the St Nazaires and La Spezias—have been coddled from this cold reality so long they cannot compete on a level playing field of true competition, This is doubly true as recession still depresses shipping demands, operator incomes and shipping earnings, as measured by the Baltic Index. So, even if the dozen-or-so Type 26 frigates as desired by the RN (plus proposed yesterday to form the blue water element of any Scottish Navy) are built by what remains of BAE shipbuilding, such has been the isolation of most yards from economic reality by their governmental protection. Unless BAE makes a step change to its yards’ efficiency, these may be the last bespoke warships the RN has the luxury of commissioning. Had the Admiralty been less bloody-minded and followed the RAF’s more pragmatic procurement, the acceptance of ‘foreign’ designs (c.f. American Apaches or Eurofighter Typhoons) might point to more positive options where they retained some control. 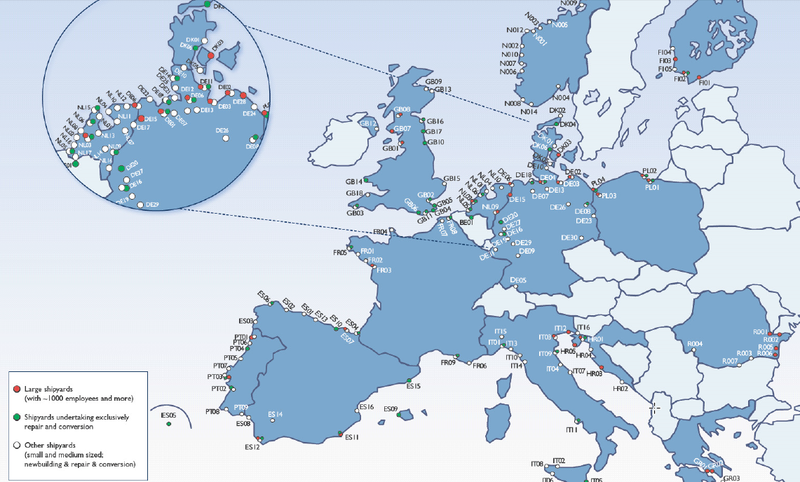 But shipbuilding in the UK has become a shadow of itself even more than it has in Europe. Any further large warships for the UK are therefore likely to be limited to non-custom (and non-local) designs with broader appeal and built by yards that can spread costs across many multiple units and customers. That’s how orientals shrewdly came to dominate this business—as the shipyard equivalent of ASDA. This entry was posted in Commerce, Transport and tagged shipbuilding; BAE; MoD. Bookmark the permalink.